My alarm roused me from a deep and dreamless sleep. I rolled over and reached towards the bedroom’s tiny bedside drawer chest for my iPhone and the alarm’s snooze button. 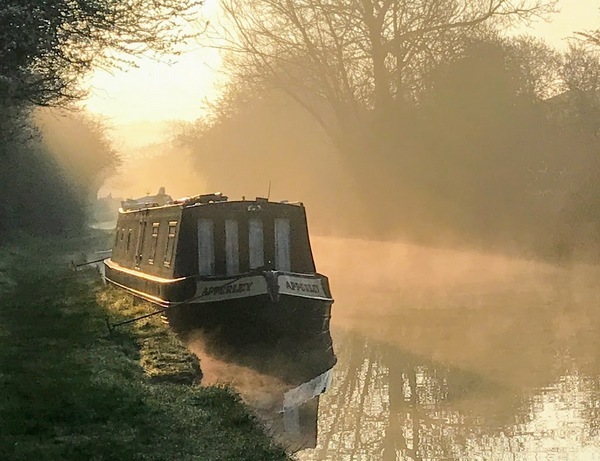 “That’s odd,” I thought, “my alarm rarely sounds like that.” Then I realised that the morning light streaming through the bedroom’s two portholes was missing and the piercing alarm was coming from somewhere at the front of the boat. I turned on the bedroom light and checked my phone. Three o’clock. Far too early for my alarm. The two wall-mounted railway lights illuminated a thick smog hugging the bathroom and galley ceiling and obscuring the front of the cabin and the source of the smoke. It wasn’t the most reassuring sight to wake to in the wee dark hours. Like most boaters, I leave my multi fuel stove burning overnight. In fact, like most boaters, I leave my stove burning twenty-four hours a day, seven days a week throughout the winter and far into England’s chilly spring. living semi-submerged in icy water has its drawbacks. I’ve been living afloat for most of the last nine years. I’ve never had a problem leaving a stove alight at night. Until now. I fill the lit stove with coal briquettes before I go to bed and then reduce the airflow to slow the burn to ensure that I wake to a warm and cosy boat, a boat usually free of choking smog. It was the smoke alarm which woke me. The carbon monoxide alarm did not. That didn’t surprise me really as the dismantled device lay on the kitchen worktop waiting for me to fit a new battery. The bitter smoke thickened as I watched, swirling ever closer to the floor and two blissfully unaware sleeping dogs. I couldn’t breathe. I struggled to think. A pounding headache probably had something to do with my confusion. I dropped to the floor, crawled back to my bedroom, threw on some clothes and then did what I could to ventilate the boat. I opened both sides of the front deck cratch cover, opened the cabin front’s double wooden doors, flung open the galley side hatch and used a boat hook to jam the Houdini hatch as wide as possible. The acrid smoke eventually cleared, the process slowed by a steady stream of smog still billowing from the Squirrel’s top vent. I didn’t want to risk sleeping again until the stove was safe. That meant either extinguishing the Squirrel’s burning coals or removing the source of the smoke from the boat. Taking the smoldering fuel off the boat would create less mess and less smoke. Opening the stove’s front door to get at the coal rapidly filled the cabin with a bitter smog again. I couldn’t either see or breathe unless I lay on the floor. 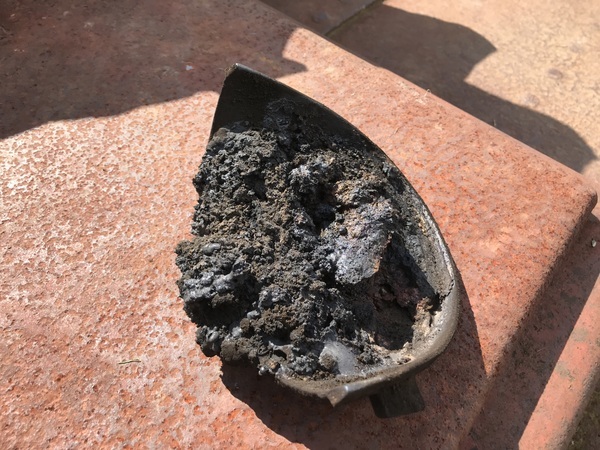 I used a coal shovel to transfer dozens of glowing briquettes from the stove’s firebox to the ash pan and threw them on the sloping mud bank next to the boat. I was alive, and the boat was in one piece. I was thankful for those two small mercies. An hour after being rudely awakened by the smoke alarm, the boat was cold and smoke free. I could breathe without coughing and think past the throbbing behind my eyes. Carbon monoxide kills. I could live with a headache, and I was alive thanks to the smoke alarm. I slept with the doors and windows open for the rest of the night. Better cold than dead. I fell out of bed at dawn the following day, worrying about a boat with no heating and the length of time I would take to resolve the problem. How hard could it be? The boat was filling with smoke rather than channelling it though the flue and out of the cabin. The stove had been drawing badly for a few days. An obstruction was obviously the culprit, one which could only be in either the flue or the stove. Surely, even my preschool DIY skills would be enough for the task at hand. Both potential blockages were easy to check. I climbed onto the cabin roof armed with a powerful head torch and a long boat hook. I removed the chimney and shined the torch down the flue. It didn’t look blocked. I lowered the blunt end of the boathook down the flue’s full length. I couldn’t feel a blockage. The problem must have been in the stove. 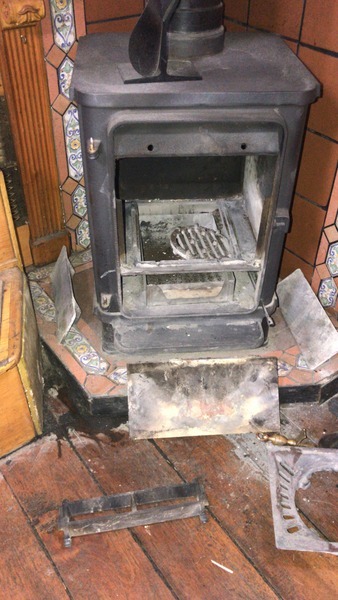 There’s a baffle plate above the firebox in a Morso Squirrel stove. It curves from the back plate over the top of the firebox. Smoke rises over the baffle plate and into the flue. An accumulation of soot on top of the baffle plate sometimes causes blockages. I swept the baffle plate clear using my head torch and a poker. I found a little soot, but not enough to block the flue completely. Hoping that a little poking and prodding with my improvised tools had cleared the blockage, I threw a firelighter into the firebox, added a handful of kindling and a match and stood back. Then I panicked when the stove filled the boat with more smoke than the previous night. After a repeat smoke and flue clearing performance I left Orient to look for inspiration. I found it in the bow locker of a neighbouring boat. “It’s a simple fix. Take out the fire brick at the back. That will allow the baffle plate to swing down so you can remove the restrictor. I think it’s a 10mm spanner you need. Do you want me to show you how to use a spanner?” Russ has worked with me at Calcutt Boats for many years. He knows me well. He was right. Removing the restrictor was a simple if filthy process. The stove’s been in the boat for just three months. You can see from the photo below how blocked it was. The stove’s now back together and working better than ever. The incident has prompted me to throw the old carbon monoxide alarm out and replace it with a new model which complies with the latest BSS requirements. I’ll also try to remember to check the batteries regularly. Apart from nearly killing myself, life afloat during the month since my last blog post has been uneventful. That’s why I like this lifestyle, far from the stresses and strains of modern day life. Far away from most stressful situations, anyway. I’ve had a couple noteworthy exceptions over the last four weeks. The first was on the marina slipway on a midweek day a few weeks ago. Calcutt Boats is a busy marina. We have boats which need pulling out of the water for surveys or for blacking every day. And sometimes we have boats brought here by road transport from other parts of the network or from builders yards. On this occasion the builders ballasted a recently refurbished boat in a most peculiar fashion. I work on the grounds most of the time, often far away from other marina activities and, because I work with noisy machinery, I can’t hear any background chatter. I didn’t know that this boat had already been into the marina once, pushed into the marina on the slipway’s wheeled steel cradle. It floated free for a minute or two and was then quickly dragged out again. All I heard was a call for anyone nearby who could steer a slipway boat. I heard snatches about the owner not wanting to steer the boat himself but i didn’t dwell on it. The owners of brand new narrowboats, often costing over £100,000, sometimes have little boating experience. I’ve met one or two who had never set foot on a narrowboat until they stepped on the back deck of a boat they had used most of their life savings to buy. I thought this was another of those cases. Anyway, the owner climbed the steel slipway steps onto the back deck with me. He appeared nervous and didn’t say much. Putting a boat back in the water is an easy job for the helmsman. All he has to do is to establish what type of cooling the boat engine has. If it’s an internal cooling system, he starts the engine before the boat hits the water. He waits until the hull sinks below the surface if it’s a raw water system. That’s pretty much it. The slipway tractor pushes the boat laden cradle down the slipway until the boat floats free. The helmsman reverses, as does the tractor driver, and the boat is back where it belongs and ready to cruise. It’s a simple process as long as the boat is in a fit condition to use. All I had to do was bring the boat onto a mooring alongside the slipway. Easy. A burst of forward throttle to counteract the reverse motion from the slipway tractor, a sharp turn to port to steer us in the right direction and a laugh and a joke with the guy standing next to me. It’s an easy and stress free job unless the boat looks and feels like it will turn over. Even on the windless day, a moderate turn tipped the boat until the gunnel touched the water and the cabin side formed a forty-five degree angle with the marina surface. Another guy stood on the bow. He probably weighed eight stone soaking wet, so his sudden switch from one side of the boat to the other shouldn’t have caused it to swing quickly in an arc until the opposite gunnel also touched the water. His movement shouldn’t have caused the sudden swing, but it did. I could see why the owner looked so nervous. The cruise to the slipway mooring point took less than a minute but took years off my life. I was confident that, if two or more people had moved from one side of the boat to the other like the guy in front, we would have turned turtle. We would have been trapped in three feet of water under a fifteen tonne boat. The popular theory among marina staff was that the boat cabin had been over plated, a process which added a considerable amount of weight. The additional weight would have increased the boat draught and brought the through-hull outlets too close to the waterline. To remedy this, they had removed some under floor ballast. The result was a pretty but dangerously top heavy boat, one which is exceptionally unstable. 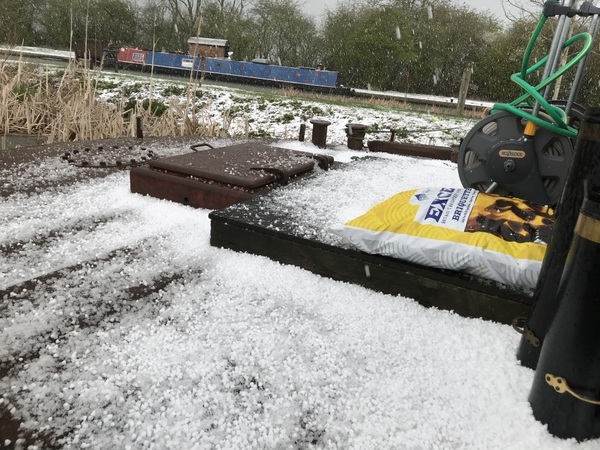 Calcutt Boats’ owner, Roger Preen, felt duty bound to warn the owner not to use the boat until they had it professionally surveyed and made safe. They didn’t. The owner and his crew subsequently took the boat for a short cruise up through the Calcutt flight to Napton junction and back again. We saw the boat, bobbing and swaying like a rubber duck in a bath, as they braved a cruise on a calm day. Heaven help them if they go out again when there’s a strong wind blowing. I’ve now used my day’s allocation of writing energy and enthusiasm, so I’ll save my second anecdote for next week. It’s a good ‘un so I know you’ll like it. Here are a few photo’s to whet your waterways appetite in the meantime. You may have noticed that my last post was four weeks ago. That’s the problem with living an idyllic life here at the marina. A wise man once said if you have nothing to say, say nothing. Much as I’ve enjoyed the last month, I’ve had little of interest to relay to you. To be frank, I’m considering hanging up my blogging hat. I get disheartened when I send out a blog post notification email and receive very few replies or comments. Maybe I’ve passed my sell by date. Maybe the written word in considered too old-fashioned now that there are so many boaters making vlogs, video logs. Maybe I should just concentrate on the commercial side of the site and give up on the fun stuff. I registered this site in 2010 when I first moved afloat. It’s always been semi commercial. Access to the vast amount of information on the site is free, but I also offer paid products and services. My most popular product has always been my Narrowbudget Gold package. It includes a bespoke online budget calculator and several digital guides for anyone thinking about living afloat. I created the package five years ago. Potential buyers have often asked me if the data is recent. It concerned me that, as the years passed, the initial data could become less and less relevant. I’ve now changed that. I’ve lived afloat now for long enough to provide different data sets spanning a reasonable period. In January this year I decided to publish one post each month just to detail the costs of living afloat. Each post covers a detailed breakdown of boating costs for the previous month, the same month three years earlier and another for the same month six years earlier. 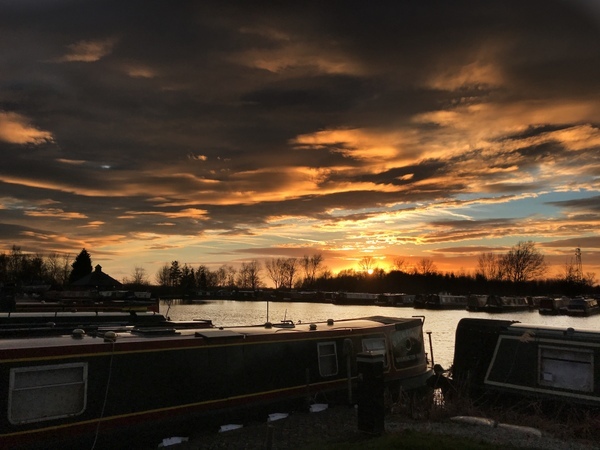 Aspiring boaters now have access to detailed narrowboat living costs that are always less than a month old, and they can compare the costs over half a decade. You can read the first of this post series here. You need to log into your Narrowbudget Gold account to read the complete article. If you want a practical boating experience, you can join me on a Narrowboat Discovery Day. 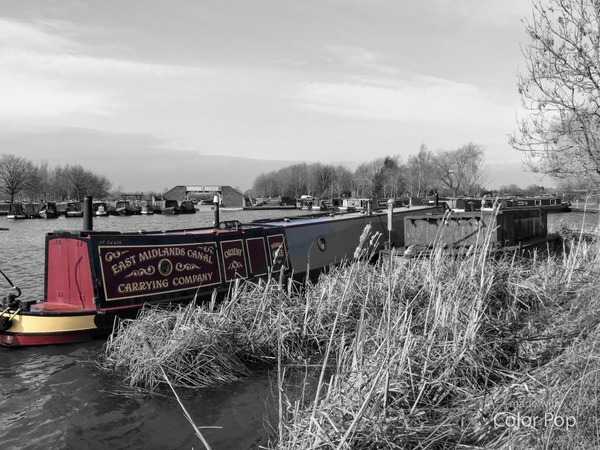 Nearly three hundred guests have joined me on my boat so far for a pleasant twelve mile, six lock cruise between Braunston and Calcutt Boats marinas. The days have been hugely successful. I think I’ve enjoyed them as the people who have cruised with me. My first boat, James No 194, was, by the time I finished refurbishing it, a superb live aboard narrowboat. James was fully equipped to live in off grid full time. Orient is as good if not better. There are a few bells and whistles to add before I’m happy, but I know what I need and how much those additions of modifications will cost. 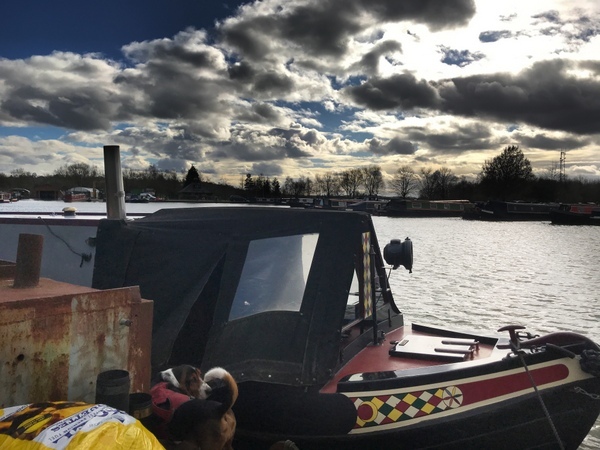 I have been receiving your newsletter for some time now, and in the last 12 months I have been thinking more and more about the possibility of living on a narrowboat myself. Your Discovery Day was a perfect opportunity to see what narrowboat live aboard life was like, and to also experience what it was like to maneuver one and take it through some locks. Plus, I had the opportunity to ask plenty of questions. My plans now are to work on funding and then I will start to look at boats when I am ready to make a purchase. All of your communications reading the logistics of the Discovery Day were perfect. Suggesting that I stay at Wigrams was a huge help. In my case they had the family crisis which prevented me from staying there, but that couldn’t be helped. Wigrams looked like a perfect location for lodging. I would definitely recommend to anyone who has any kind of interest in narrowboats to join you for a Discovery Day. It is an excellent way to learn what it is like to live on one full time. 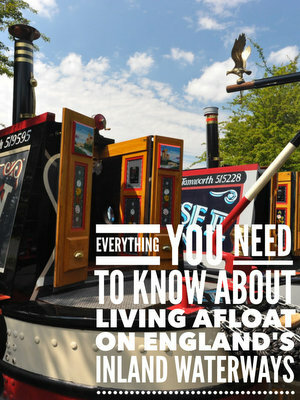 It is also the perfect way to learn about boat systems and the logistics of living on the canals in a narrowboat. You have years of experience living on narrowboats. You are based in a marina and work in a marina, so you see all aspects of daily narrowboat/marina life. You also have a very professional and relaxed way of interacting with your visitor. You encourage questions and don’t have any judgement about how little experience a visitor may have when they join you. You put everything you have into the day to make it an enjoyable, memorable experience for the visitor. Thank you so much again Paul. Anyway, I’ve waffled on too long. If you want to discover the actual cost of living afloat, you can find out more about my Narrowbudget Gold package here. If you want a hand’s on chance to experience the reality of living afloat, my Discovery Day page is here. And if my blog posts interest you or are useful to you, reply to the introductory email to let me know. Either that, or email me through the site’s contact form. I want to carry on blogging. I enjoy writing. Some site visitors even say I’m quite good at it. However, there’s no point in me investing my time and money in a website that no one is really interested in.